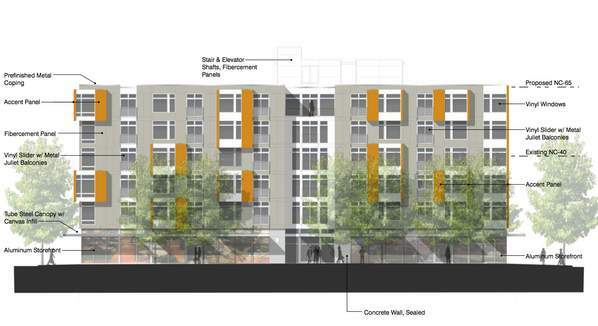 Shown in the elevation above is the six-story mixed use building that has been proposed for the southwest corner of 23rd and Union in the Central District. The project was approved by the Design Review Board on April 2, but still needs City Council sign off on a contract rezone to raise the height limit from 40 to 65 feet. Given the apparent popularity of bloviations on density such as this, as well as all the recent hyperventilating over proposed changes to Seattle’s multifamily zoning code, it is perhaps surprising that there hasn’t been more of an uproar over the prospect of tinkering with allowed building heights in a residential neighborhood. The short answer is this: 23rd and Union ain’t Wallingford. That intersection has been a gaping wound for so long that most neighbors are probably willing to cut the developer a whole lot of slack. Furthermore, the location of the building is such that it will impact very few surrounding properties. But regardless of the context of that specific site, from the perspective of sustainability, the upzone is a no-brainer. Indeed, density in Seattle’s neighborhoods is a lot more controversial than it should be, given the City’s reputation for a green citizenry. It is indisputable that densification is a critical development strategy for achieving long-term sustainability. 23rd and Union is about a mile from the downtown core of one of the biggest cities on the west coast. If we can’t put a six-story building there, we can’t in good conscience utter another word about how green we supposedly are. So now it’s up to the City Council to do the right thing. Is there anyone out there who’s had experience with a decision like this and could give us some idea of what to expect or how we might be able to make our opinions heard? P.P.S. Full disclosure: I live two blocks from the site, i.e., close enough to enjoy all the neighborhood benefits of the building, but far enough away to not be negatively impacted in any way. Posted by dan bertolet on	Saturday, April 5th, 2008 at 9:48 pm. You can follow any responses to this entry through the RSS 2.0 feed. You can leave a response, or trackback from your own site. Do you know the specific benefits that rezoning this from 4 to 6 stories will give us? Will these extra two stories qualify for an affordability bonus? Oh yeah, and will this building solve the neighborhood’s problems by addressing them head on or is it just gentrifying them away? Or am I just hyperventilating by asking these kind of questions? Greg, as far as I know there is no explicit public benefit such as affordable housing being offered by the developer in exchange for the upzone. But as I see it, the public benefit of simply having a building on that site is huge. The site has sat unused for seven years and the whole neighborhood has suffered for it. The developer has said that he can not make a quality project pencil with four stories. The fact that no one else has attempted to develop a 4-story building there over seven years lends credence to the developer’s claim. My biggest fear is that if the upzone is not granted, we’ll end up with a much crappier 4-story project, or nothing at all for years to come. In my view, the developer is not an enemy who will be getting something for nothing if the upzone happens. I am grateful that the developer is proposing to bring us a well-designed project at an appropriate scale in a neighborhood that has suffered from neglect for decades. Your question about how the project addresses the needs of the neighborhood is a good one. In the short term, what that corner needs more than anything is lots of eyes on the street. The issues of race, poverty and gentrification in the Central District are complex and deeply rooted in our society as a whole. In what way do you think that site should be developed in order to address these issues head on? The developer said that if it’s only 4 stories, the building (assuming it got built) would not have underground parking, so instead of ground floor retail, you’d get ground floor parking — ugh. That right there justifies the upzone for me. are we really fooling ourselves. since when is 2 stories the make or break in gentrifying seattle. the neighborhood suffers from neglect, I agree. but if we are really interested in gentrification and ’society as a whole’ we shouldn’t be looking at making exceptions for one development but density building in the zoning structure on a more systematic level. otherwise we just favor those folks who are looking for a good deal and less interested in the community they are moving into. If we can’t put a six-story building there, we can’t in good conscience utter another word about how green we supposedly are. Couldn’t they be granted a variance which would cover the difference? If not, the neighborhood boards should be allowed to vary specific projects at their discression. An up-zone requires a city council-vote, which seems like WAY too high a bar to be crossed in this case.